I one thing we have always grown really well on the allotment are nettles! It really isn’t intentional, but we seem to grow a super strength variety. One caught me today, stinging me through a glove and I spent a good five minutes, nearly crying, trying to find a doc leaf to rub on the sting. It still hurts now 3 hours later; they really are weapons grade nettles! I made loads of this, some to freeze and some to eat straight away. First blanche the nettles in boiling water to de sting them. Drain the nettles, and leave to cool. When cold, combine with other ingredients and blend until smooth. 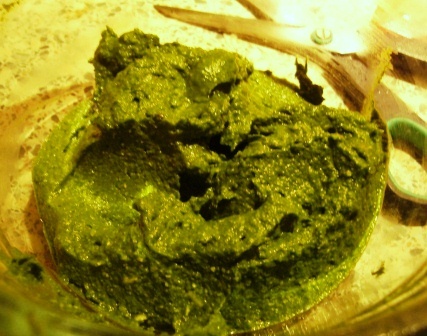 This recipe makes a very thick pesto, so you can add more oil as you wish but it is easier to get into ice-cube trays ( my prefered method of freezing) and add more oil or other ingredients when you come to use it. To be honest I didn’t detect a particularly nettley taste, the cheese and garlic take centre stage, but it is a fantastic green colour; and knowing I had made something tasty out something that pains me on a regular basis made it all the tastier! Disclaimer. Wear gloves when picking nettles. Only pick from an area you know has not been sprayed with weed killer or other nasties. Just the top leaves will do, please pick responsibly! 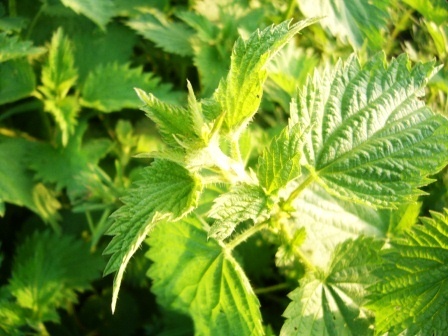 Remember to rinse the nettles before cooking to remove any bugs, grit, etc. I’ve been dining alone this week as The Man has been at a conference in the Netherlands. It’s always tempting not to bother too much when I’m on my own but pretty soon I get fed up of tins of soup and baked beans and need some fresh veg and a bit of spice. 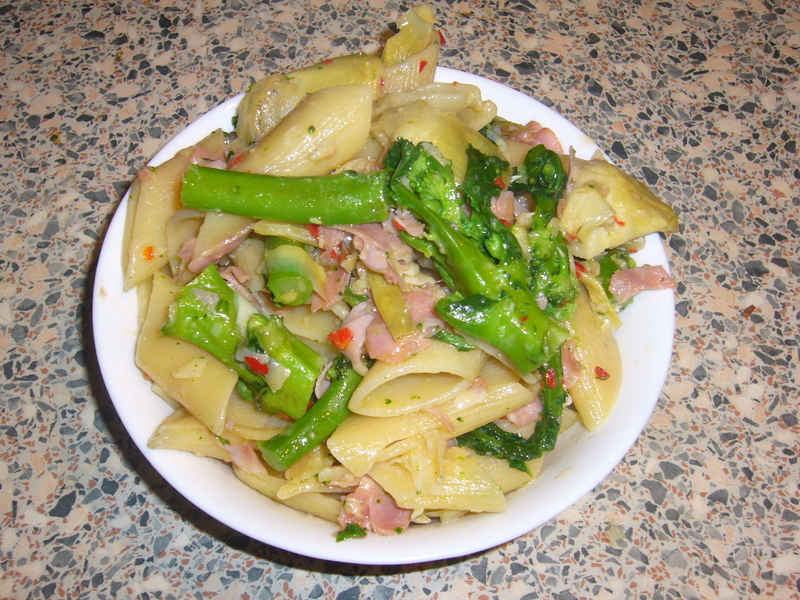 Monday night dinner was pasta with purple sprouting broccoli, garlic, chilli and a little ham. 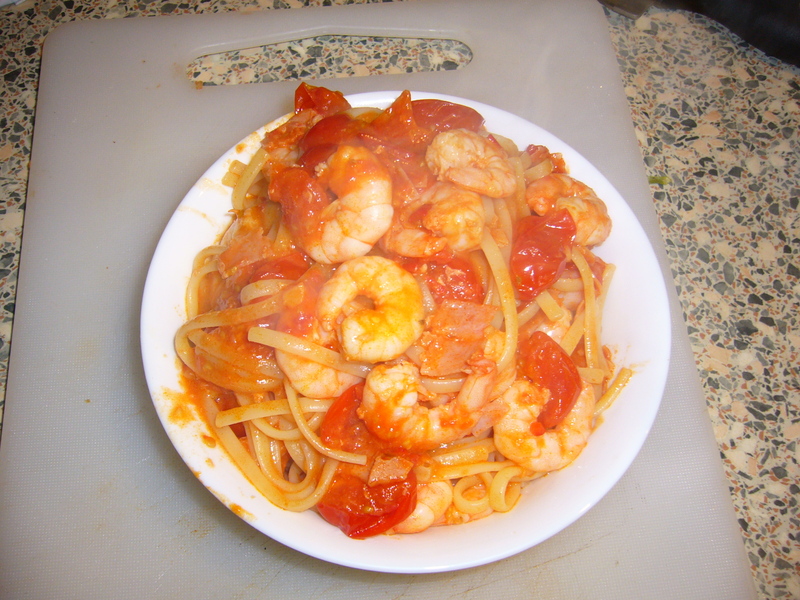 It was really quick to make and very tasty. Cook as much pasta as you fancy and while it is cooking heat a little olive oil, and gently fry the chilli and garlic ( again as much as you feel like), and add the ham to heat through, add the broccoli to the pasta to cook and when it is as cooked as you would like it drain and mix with the chilli and garlic oil, stir to coat and serve. Add parmesan to taste.